The following 2 photos were most likely taken at a Mobily storage facility and then posted on an Arabic forum. 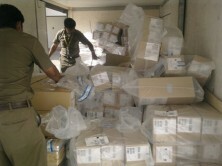 You can see the Mobily stickers on the boxes (blue on white) and on the uniform (apparently it’s yellow). Mobily has yet to announce the official release date in Saudi Arabia so we could be looking at an October 2nd release instead of September 25th. Source: A thread on the ADSLGate Arabic Forums. will they offer prepaid bundles? is the other one the white iphone4? I don’t think so. Apple is yet to release the white iPhone 4 and is rumored to be later this year (most probably December) 😉 Thanks Khaled for the head’s up! 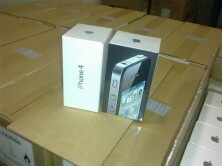 just want to ask the nearest mobily outlet here in Al-Kharj that will sell iphone 4? Thanks! better contact mobily or check their site. also follow @mobilycio on twitter I am sure he will announce it. I don’t liked Mobily. especially when they play hard to get game, with 3GS i hated how they love to say this is the last peace! when they hand you the iPhone (after weeks of chasing it coress thier branches)! can we make a reservation for it !!? where is the nearest outlet of mobly or stc? Here in dammam?.. Im near jubail or al khobar?thanx. where is the nearest outlet of mobly or stc? Here in dammam?..